...when he pulled the mighty Excalibur from the stone. For you see, that is exactly how I felt as I opened the package I got from NewEgg.com. Electricity crackled in the air. My knife found it's way into my hands, slashing through the box's tape as if it had a mind of it's own. There was something drawing me into that box, something mystical. I opened the box, and what did I find, but a brand new Black Asus EEEpc 4G Galaxy! Bow down! 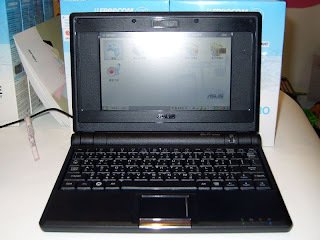 Tremble before the awesome might of the mighty and awesome EEEpc!! 900 mhz (capable) processor. 7" screen. 1GB ram (upgraded). 250GB WD passport external drive. 8000 mah (theoretically 5 more hours) external battery. Touchscreen kit on it's way. That's right folks, I'm portable. And in a few months, when I upgrade my cell phone plan to include internet, there's no stopping me. NO STOPPING ME!!! There will be no more boundaries. There will be no more sounds save the crying--my cries of joy, and your cries of unimaginable longing. GTA Vice City-You better believe it. Those are the ones I had to have working. I'll eventually get to installing Diablo 2 and Jedi Knight, (both reported to work) but that's a ways off. The games are cool extras but this baby's purpose is writing, web surfing, and watching videos on the go. As far as typing on this tiny keyboard, I just clocked myself in at 55 wpm, which I find shocking. The last time I tested myself on a full keyboard I kept bouncing around between 60 and 80. If I really pushed it, sat down at an actual desk and worked at it for 20-30 minutes, I'll bet I could hit 80 wpm at least. I have some notes after the fold on the accessories and OS's I'm using, along with my success with them.